Light-independent chlorophyll (Chl) biosynthesis is a prerequisite for the assembly of photosynthetic pigment–protein complexes in the dark. Dark-grown Larix decidua Mill. seedlings synthesize Chl only in the early developmental stages and their Chl level rapidly declines during the subsequent development. 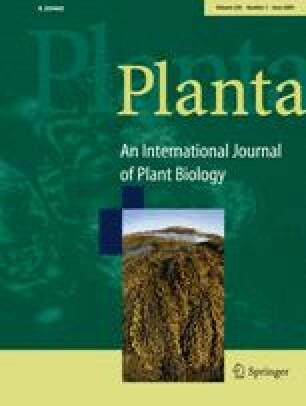 Our analysis of the key regulatory steps in Chl biosynthesis revealed that etiolation of initially green dark-grown larch cotyledons is connected with decreasing content of glutamyl-tRNA reductase and reduced 5-aminolevulinic acid synthesizing capacity. The level of the Chl precursor protochlorophyllide also declined in the developing larch cotyledons. Although the genes chlL, chlN and chlB encoding subunits of the light-independent protochlorophyllide oxidoreductase were constitutively expressed in the larch seedlings, the accumulation of the ChlB subunit was developmentally regulated and ChlB content decreased in the fully developed cotyledons. The efficiency of chlB RNA-editing was also reduced in the mature dark-grown larch seedlings. In contrast to larch, dark-grown seedlings of Picea abies (L.) Karst. accumulate Chl throughout their whole development and show a different control of ChlB expression. Analysis of the plastid ultrastructure, photosynthetic proteins by Western blotting and photosynthetic parameters by gas exchange and Chl fluorescence measurements provide additional experimental proofs for differences between dark and light Chl biosynthesis in spruce and larch seedlings. This research work was supported by grants from the Slovak Research and Development Agency (APVV-20-020805), Scientific Grant Agency of the Ministry of Education of the Slovak Republic (VEGA 1/3288/06) given to J. H. and from the Sonderforschungsbereich (SFB 429-DFG) given to B. G. We thank Y. Fujita and J. Komenda for kindly providing the primary antibodies used in this work and Jarmila Šramková for excellent technical assistance.